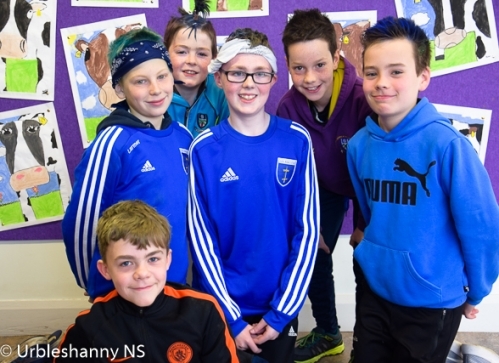 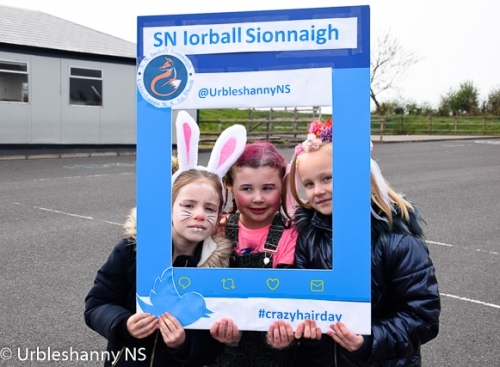 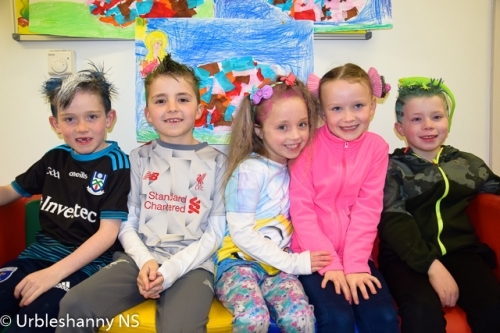 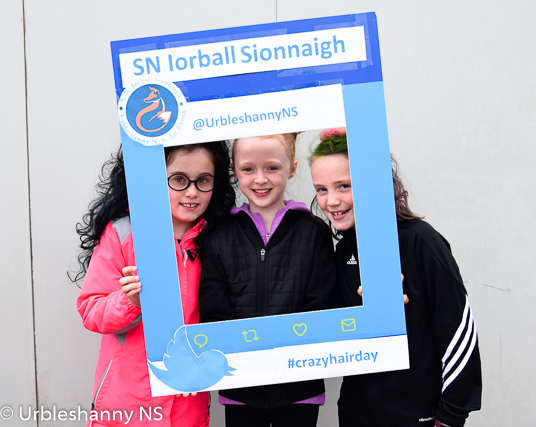 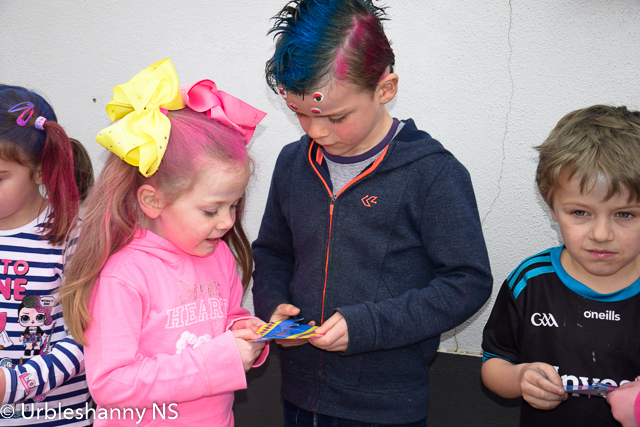 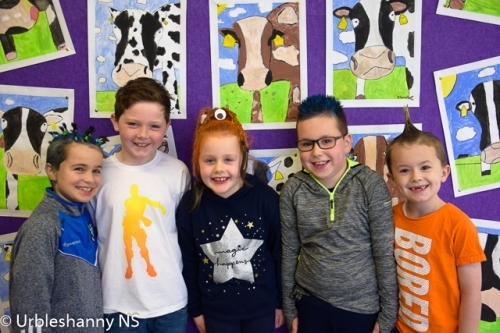 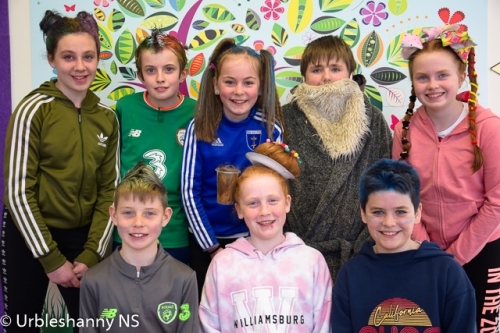 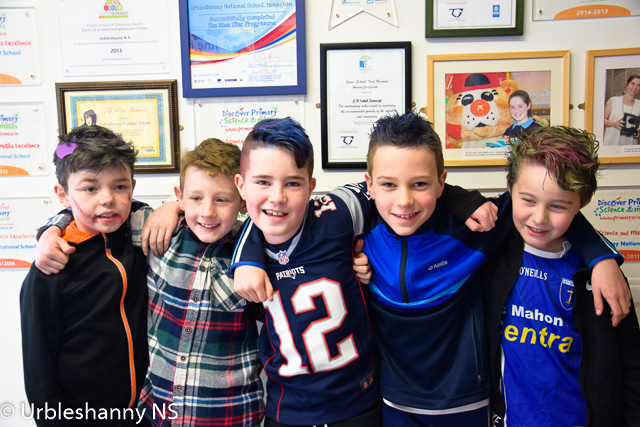 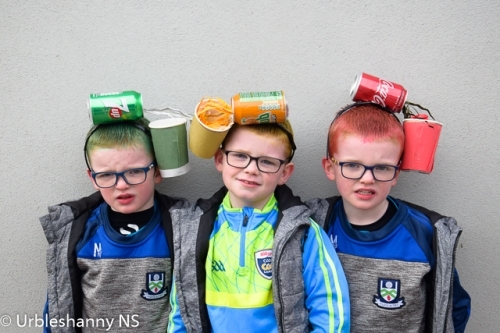 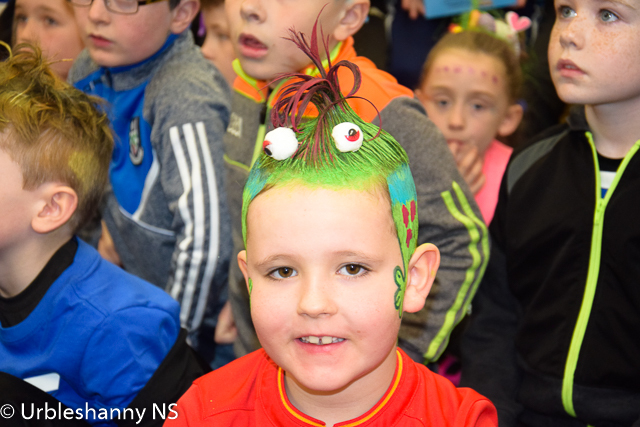 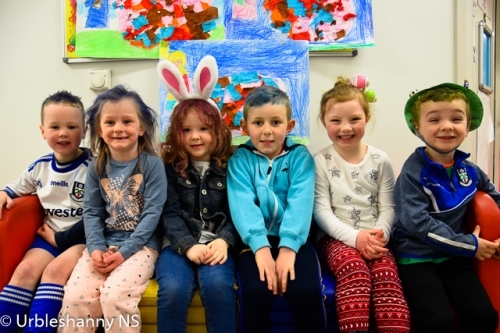 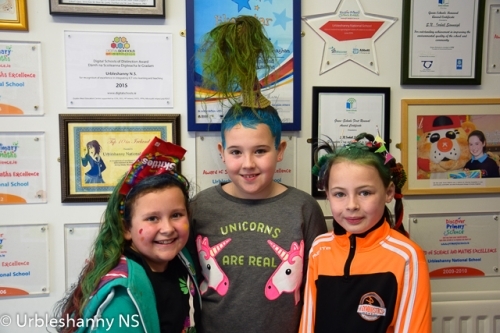 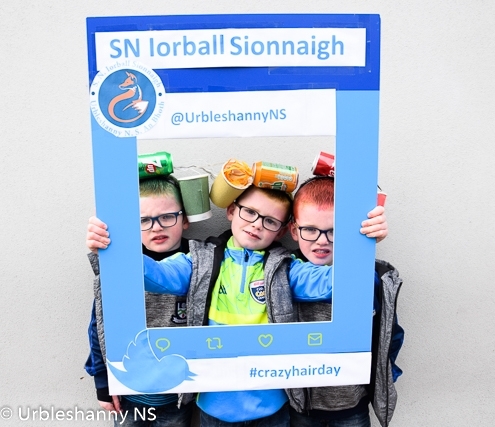 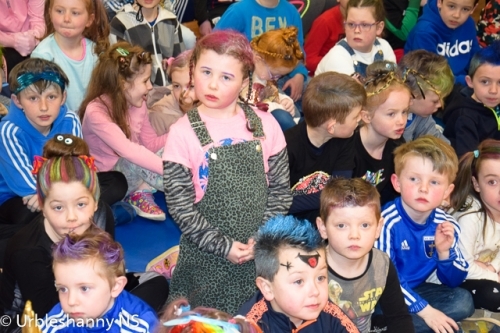 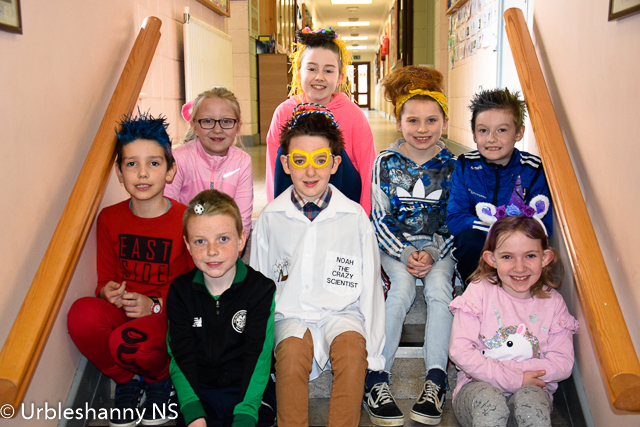 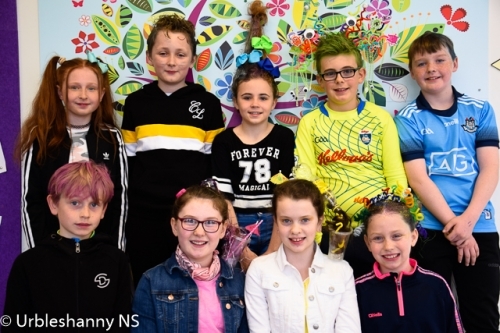 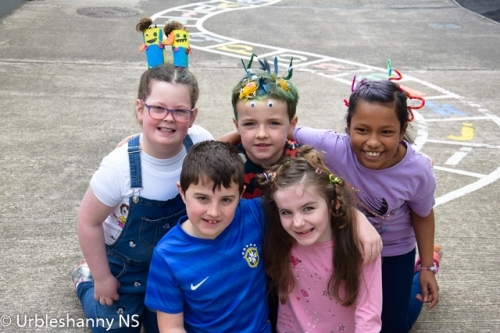 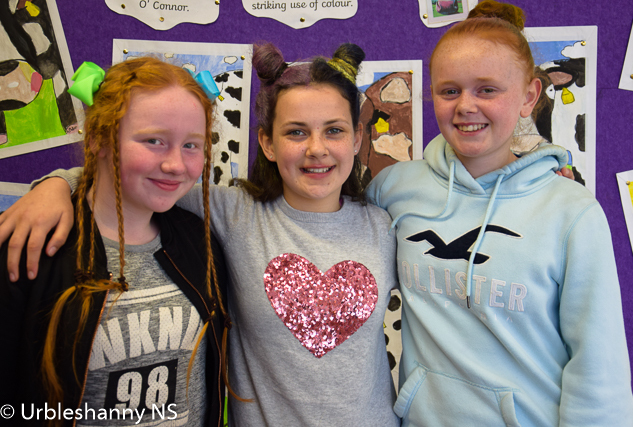 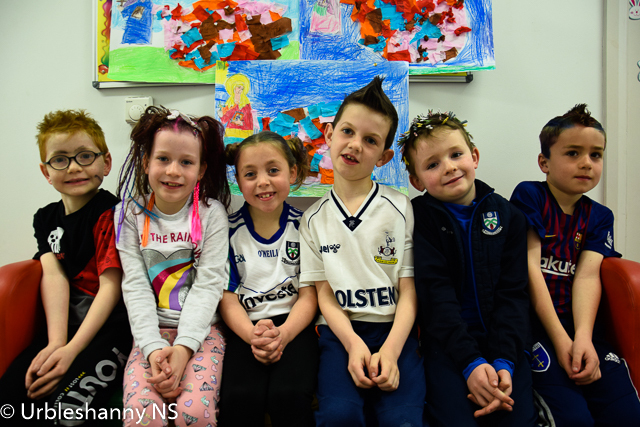 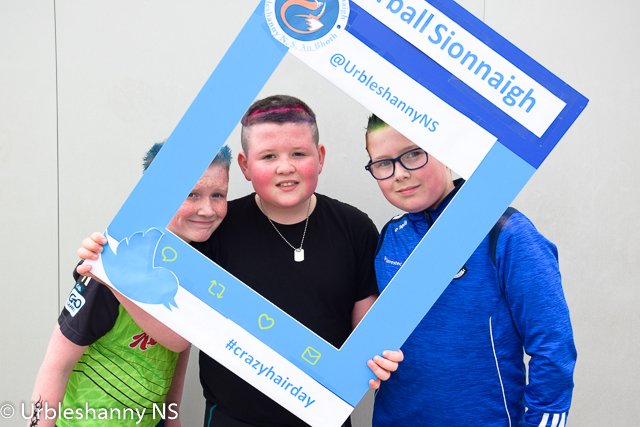 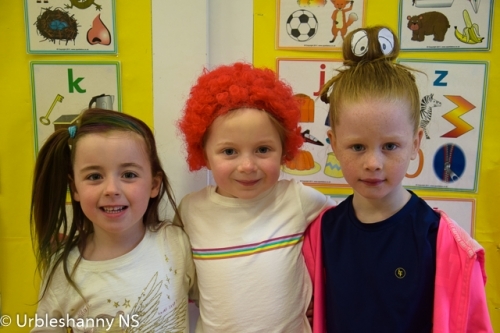 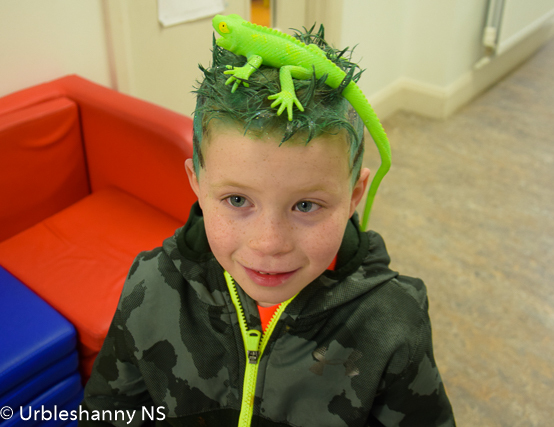 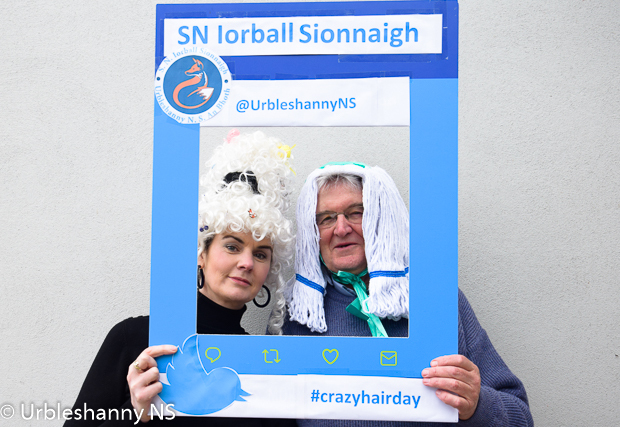 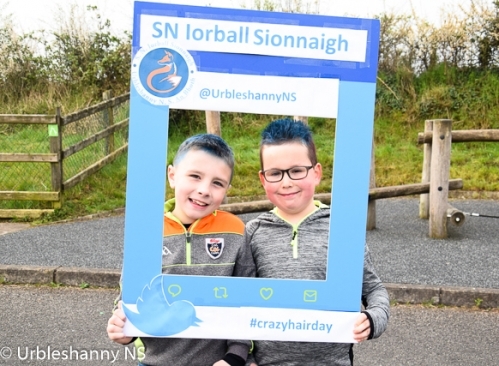 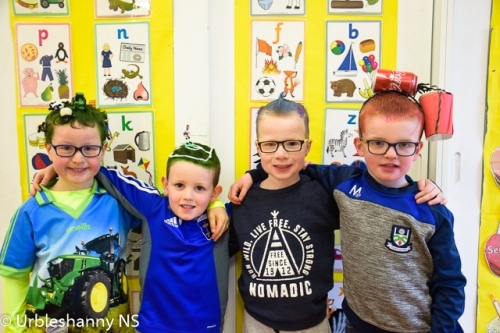 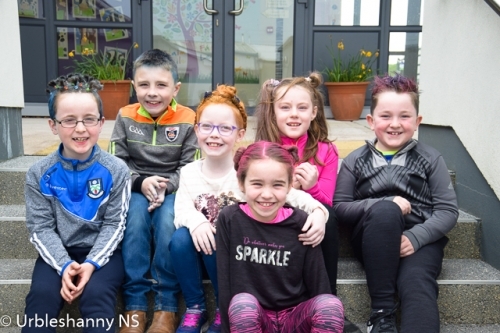 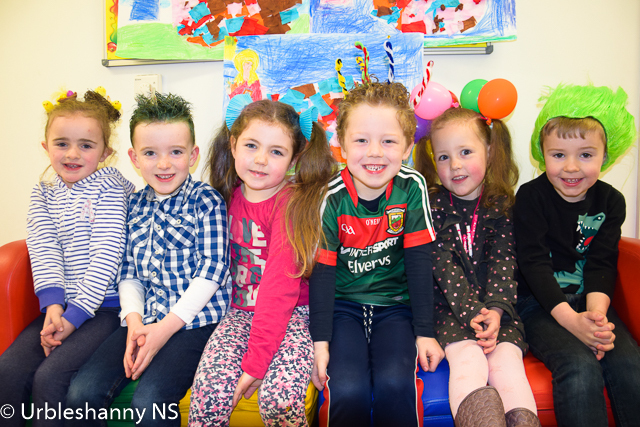 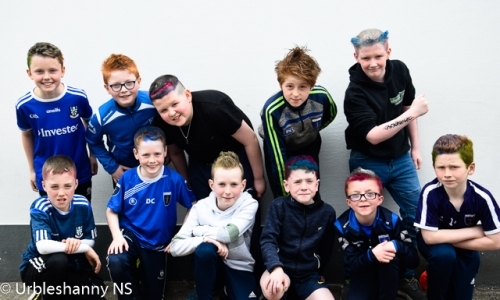 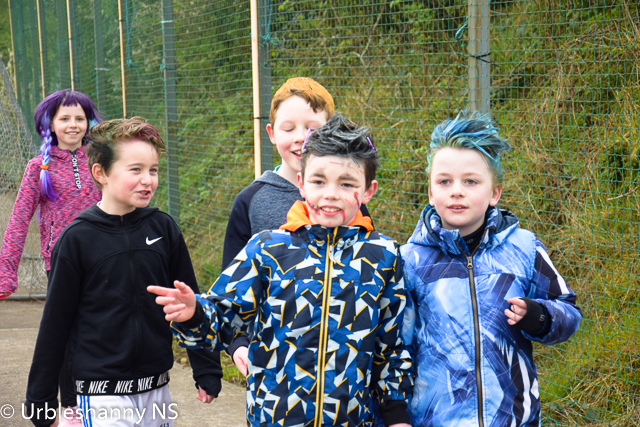 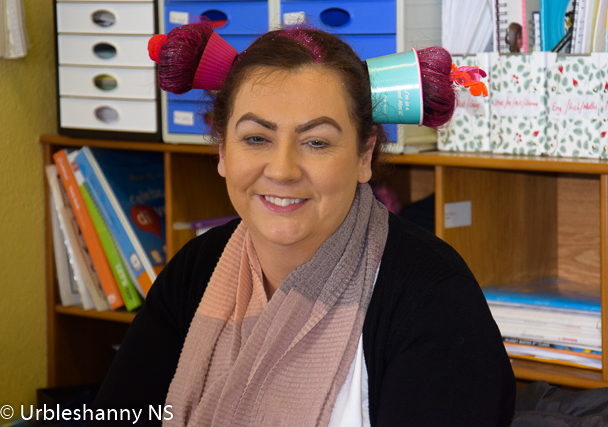 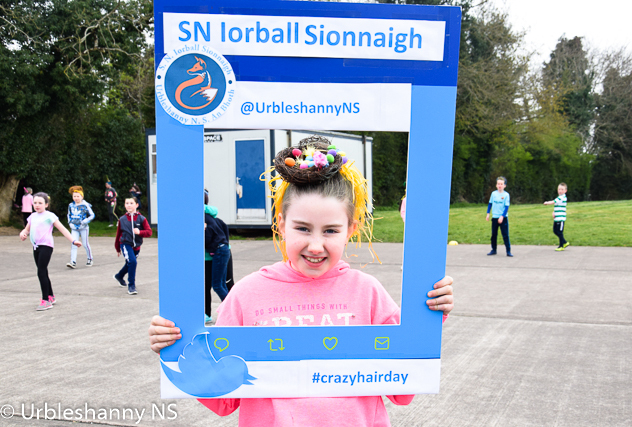 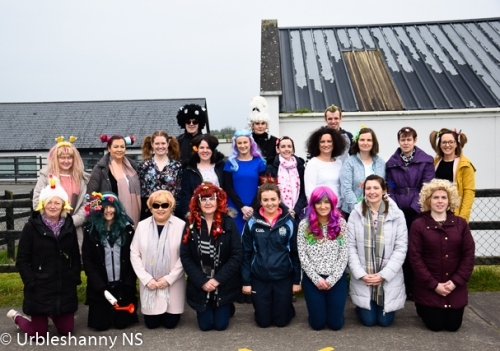 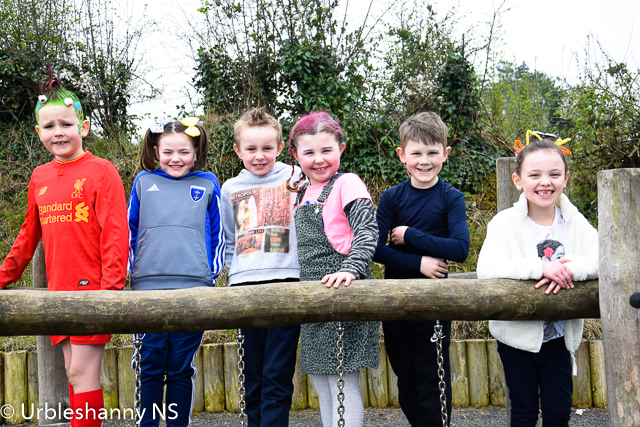 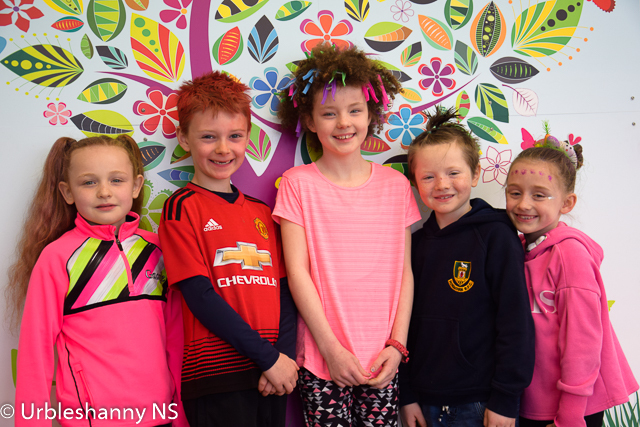 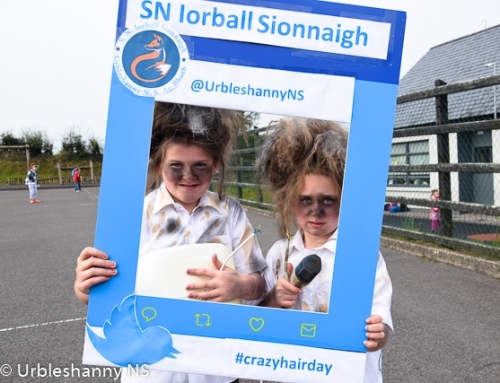 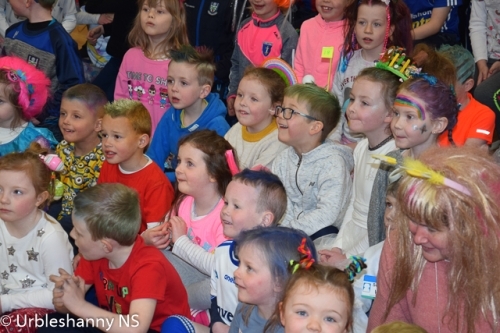 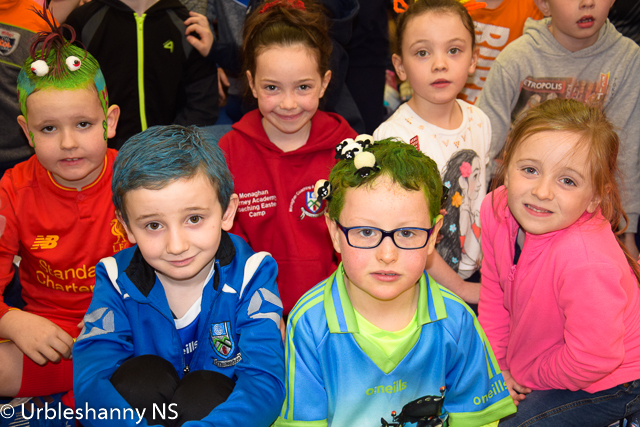 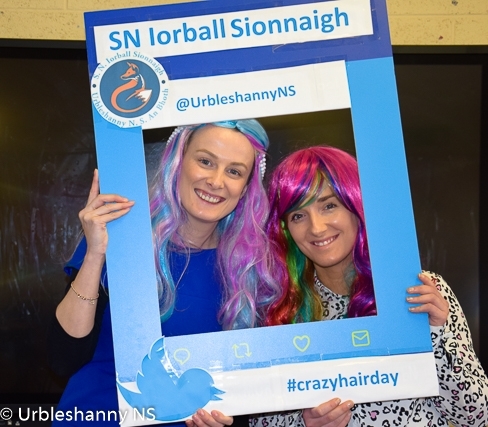 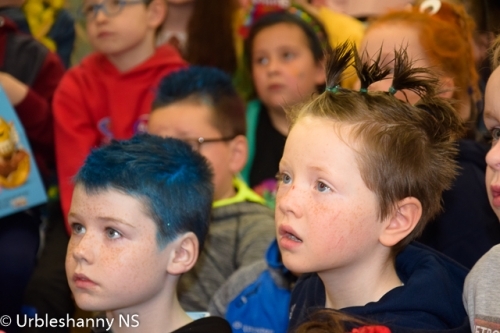 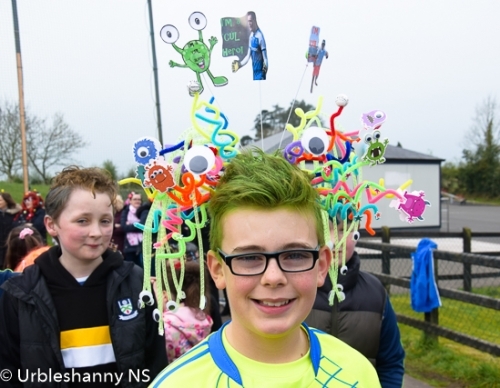 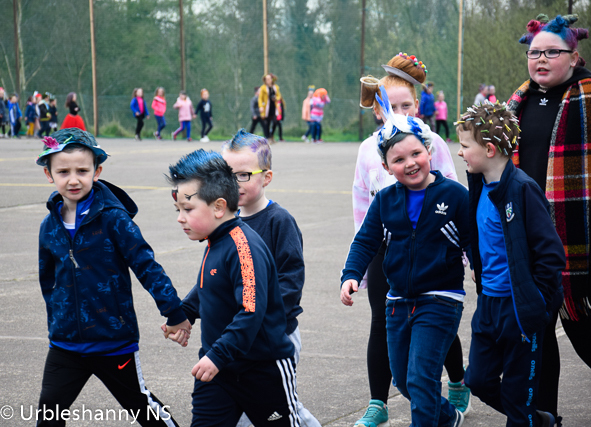 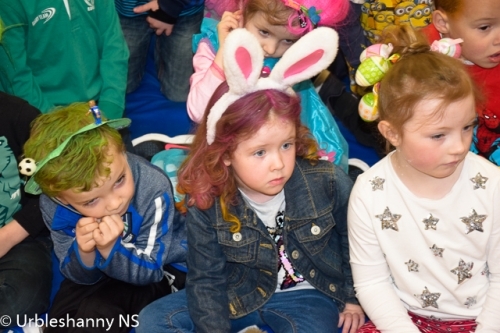 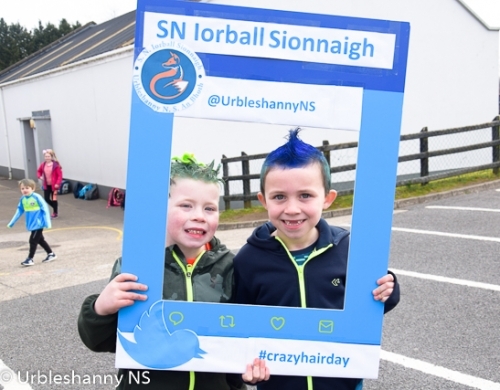 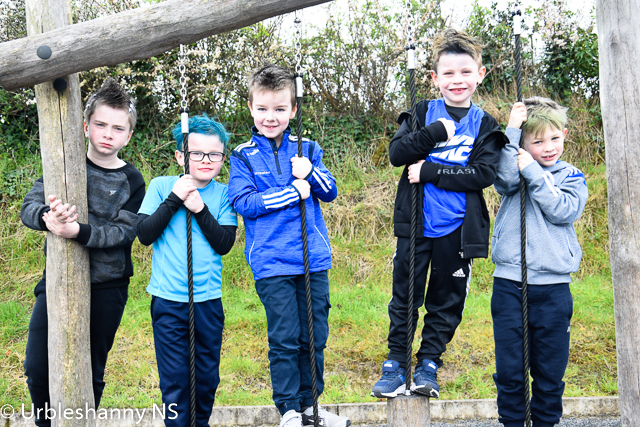 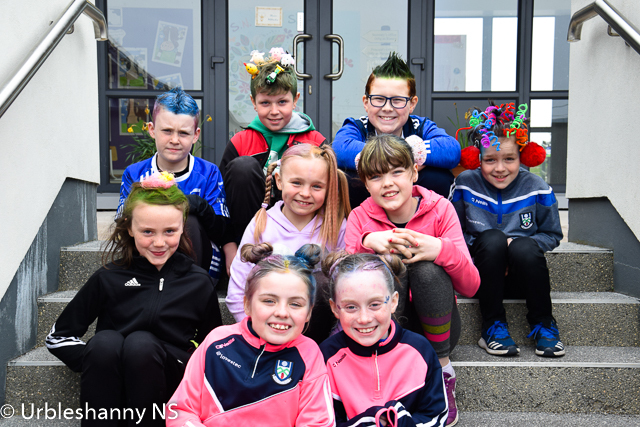 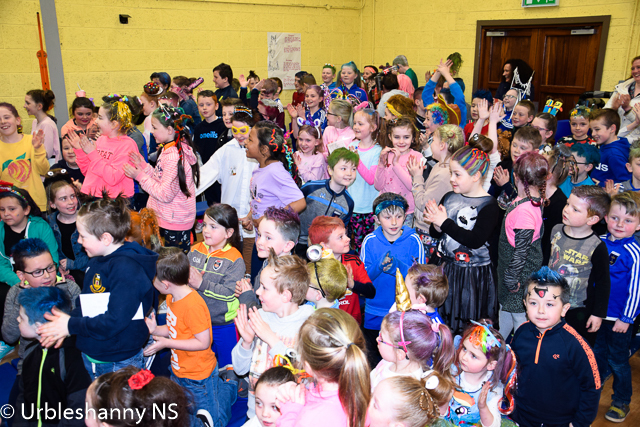 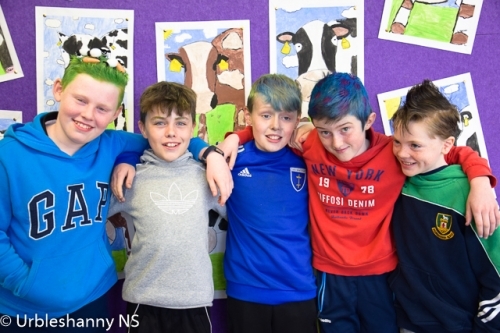 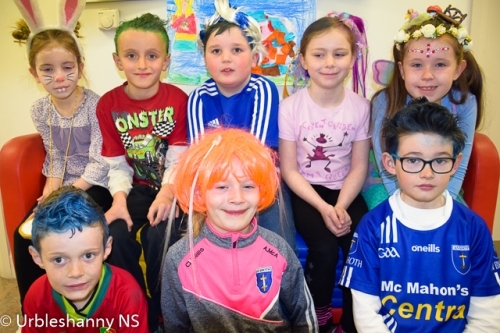 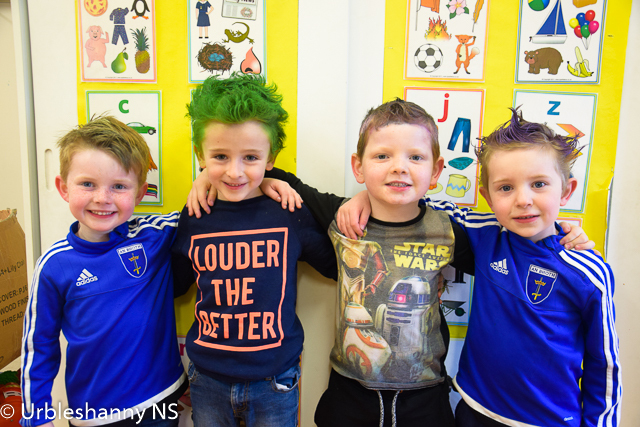 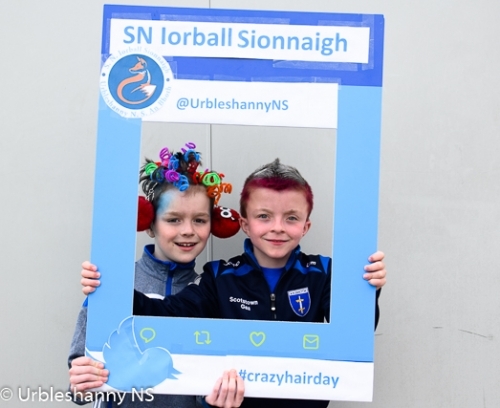 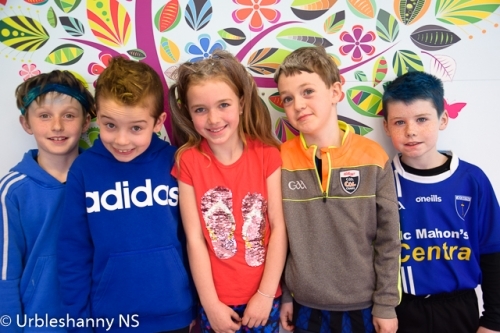 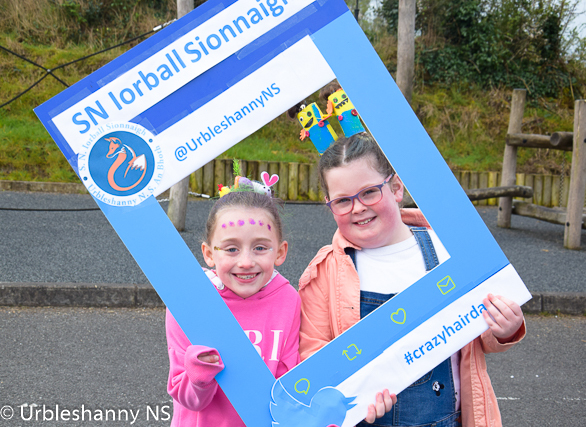 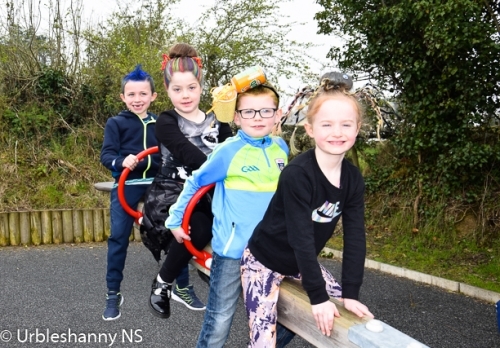 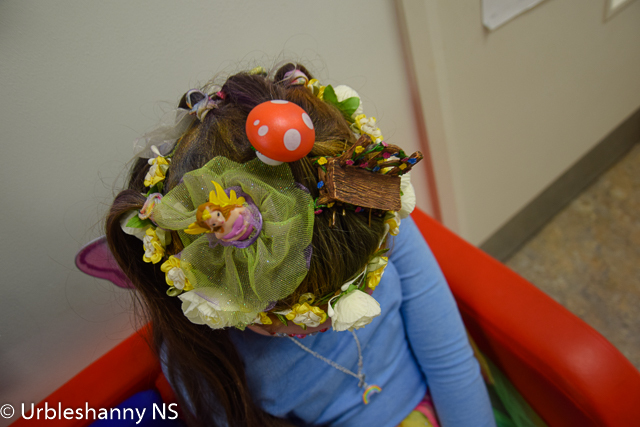 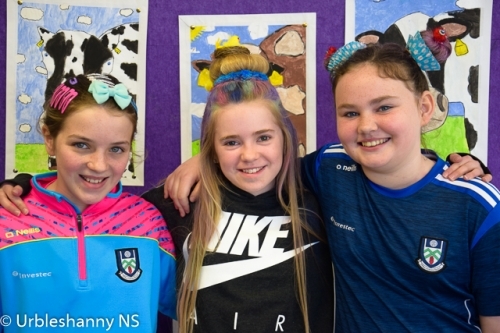 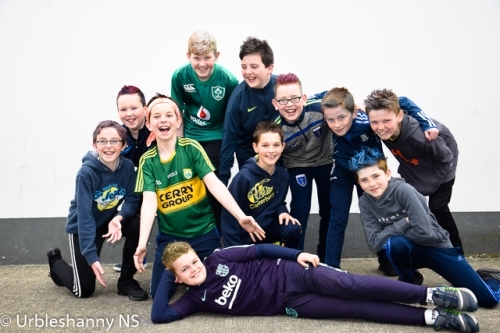 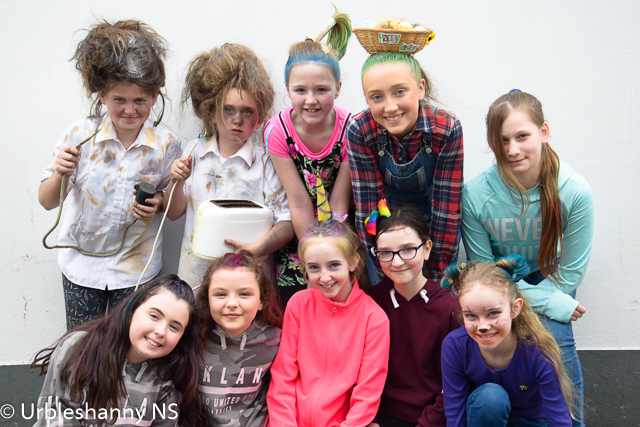 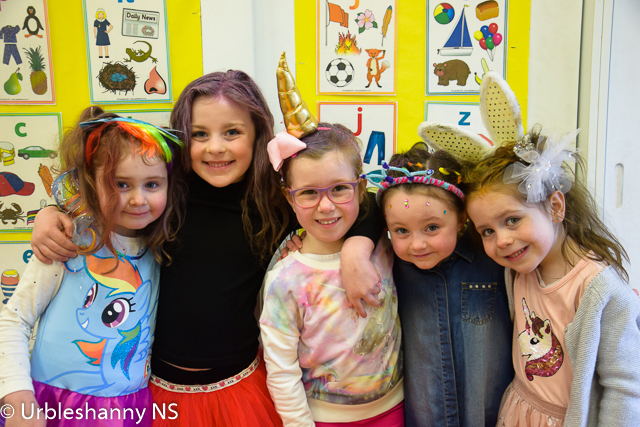 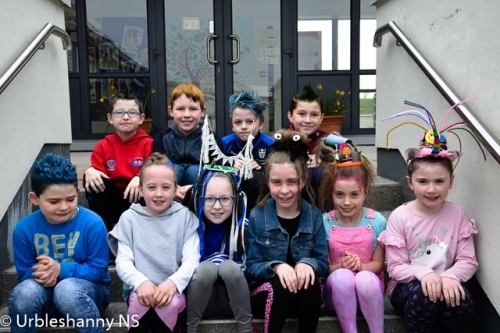 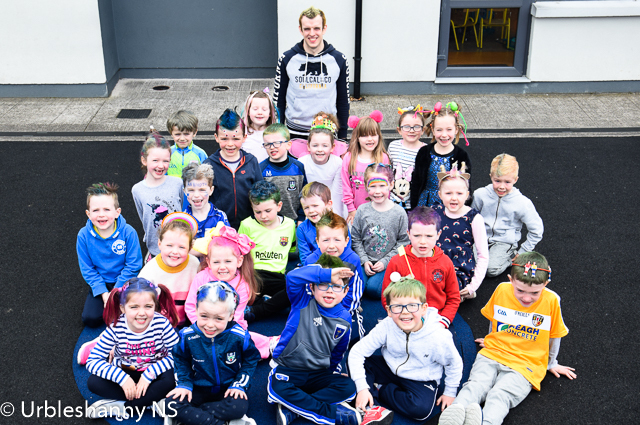 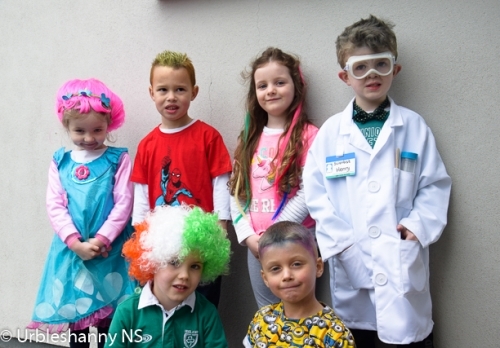 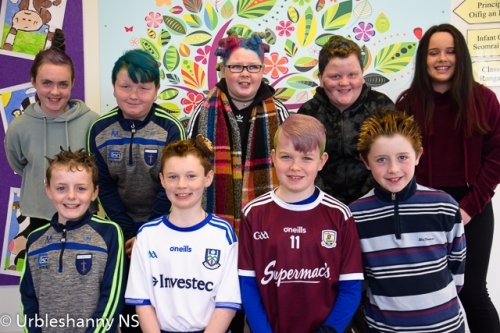 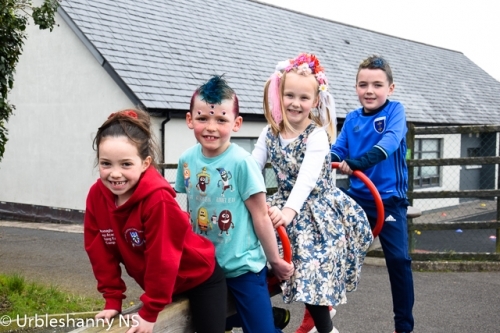 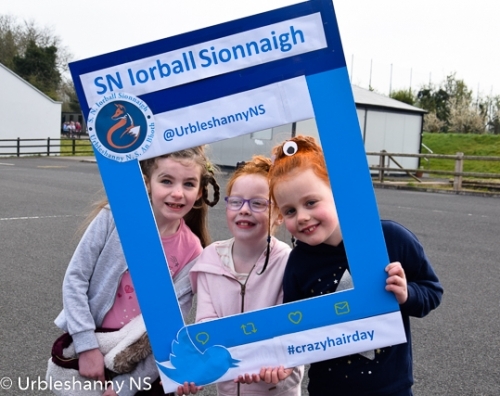 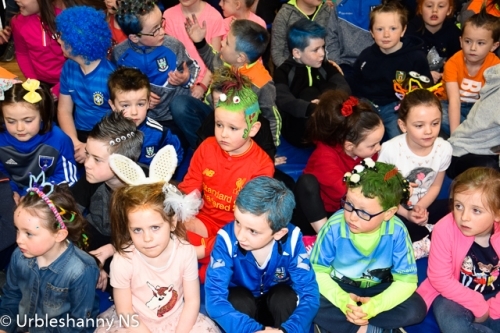 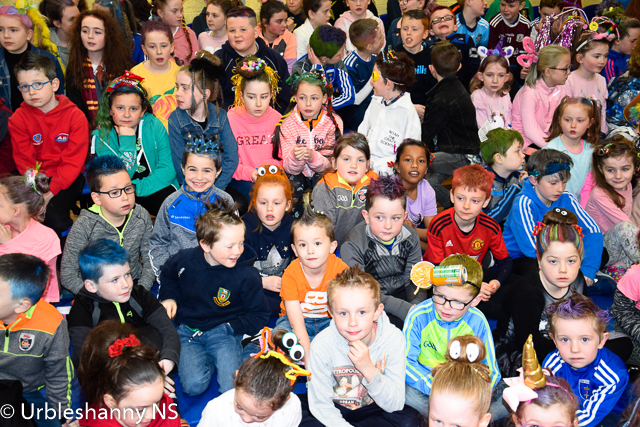 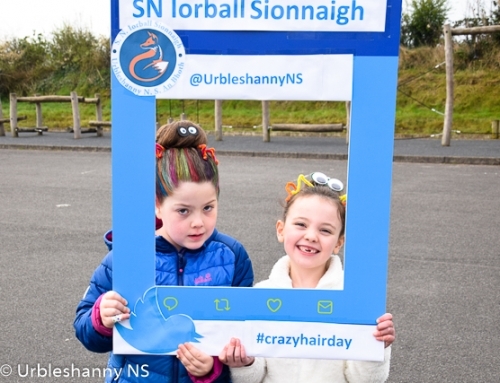 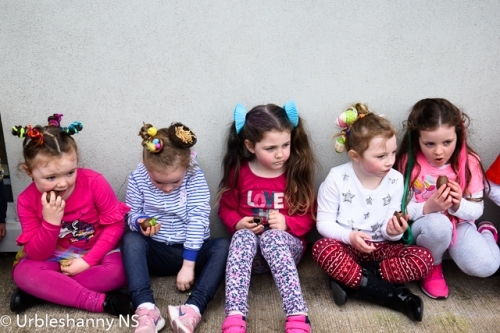 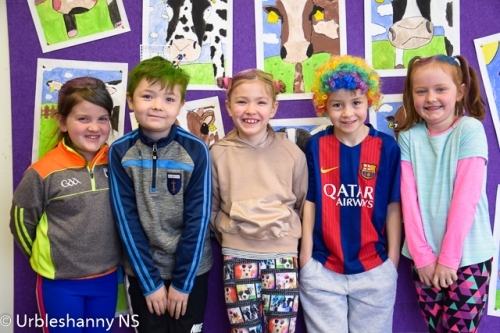 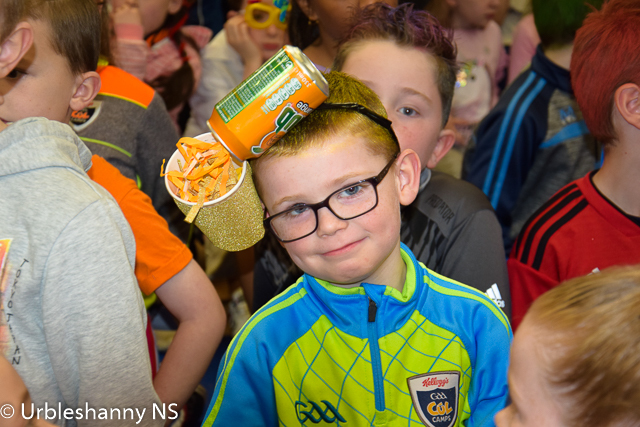 Our annual Lenten fundraiser took place today, Thursday 11th April, with Crazy Hair Day as our fun theme this year. 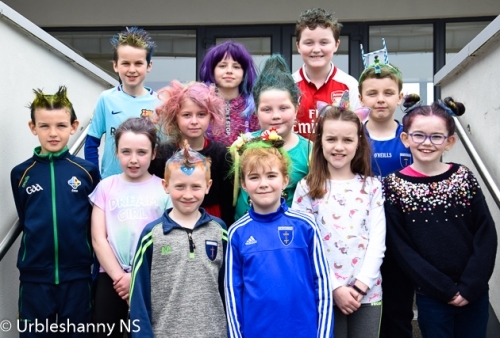 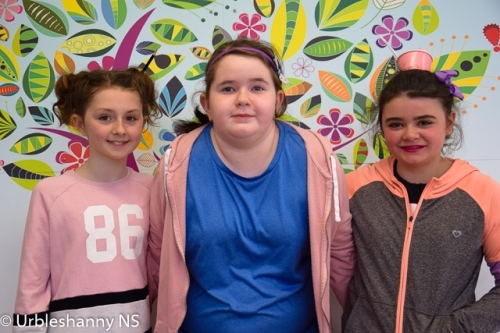 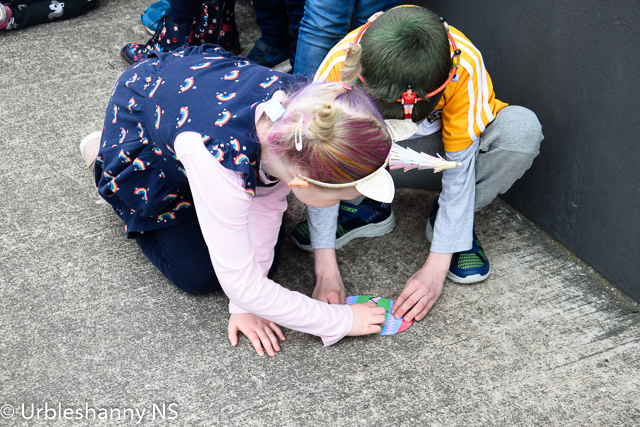 Every year fundraising is fun and everyone, from the Principal and staff, the caretaker Gerard and secretary Caroline, right down to all the pupils in the school, embrace the notion of a fun day with the end goal to raising much needed funds for various charities. 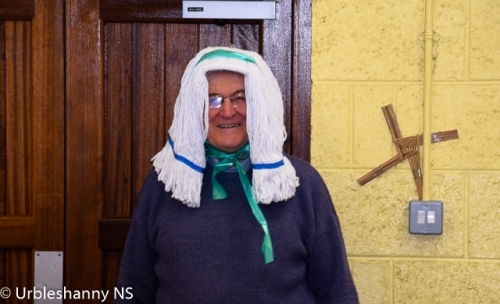 Indeed while all staff and pupils were assembled in the school hall this morning for the raffle, we were surprised by a late entry to the event by the Chairperson of the Board of Management, Fr Early, who entered resplendent with his amazing mop of crazy hair (mop being the operative word). Well done Fr Early for stealing the show and receiving a standing ovation from all the children! 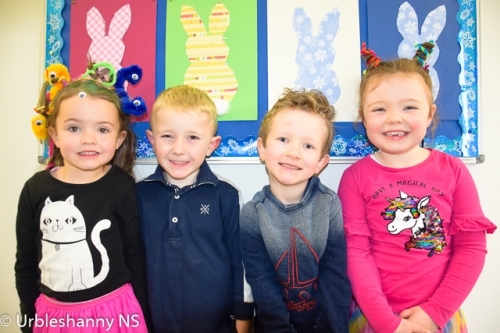 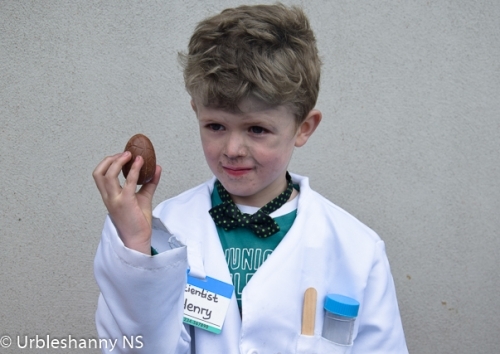 Making this a fun day included egg hunts and activities for the junior classes while the older classes took part in games and also made chocolate egg nests and fudge. The various raffle prizes were contributed by the staff of the school which consisted of Easter eggs and vouchers for Monaghan town and by the wider community such as a voucher from Sliabh Beagh, Omniplex Cinema Monaghan, Coral Leisure Monaghan, GR8 Castleblayney, an Easter cake from D's Cakes by Deanna Campbell, 2 signed footballs from Monaghan County team, vouchers from BOM member Caroline Cassidy from the village Barber Shop and a fabulous hair hamper from Scotstown Pharmacy. 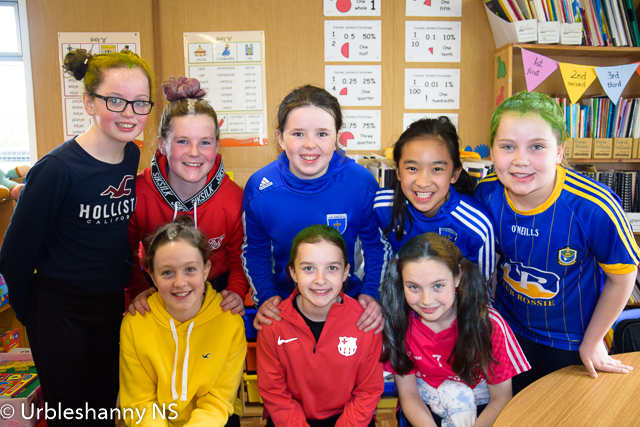 Thanks to all who generously donated to the fundraiser. 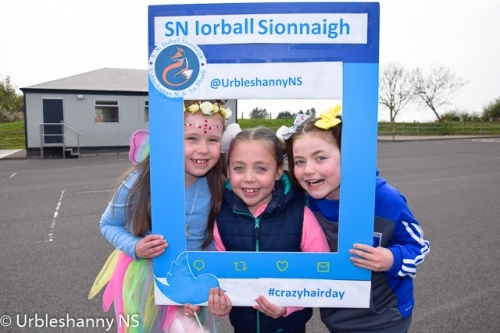 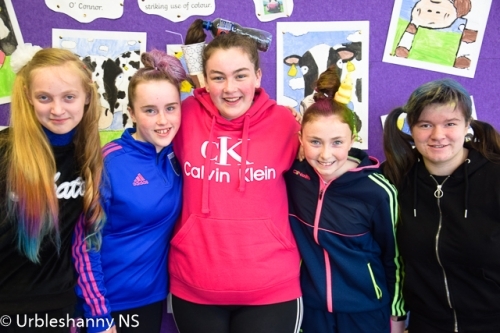 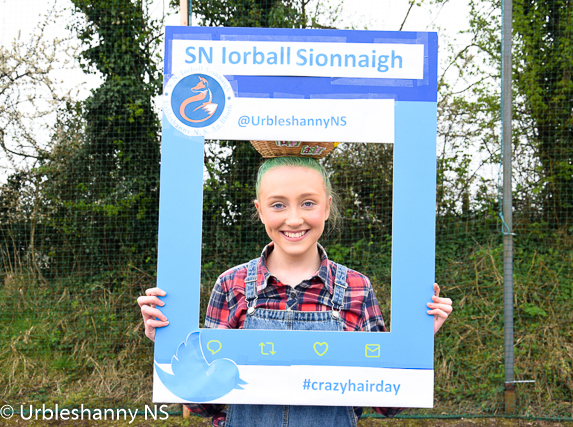 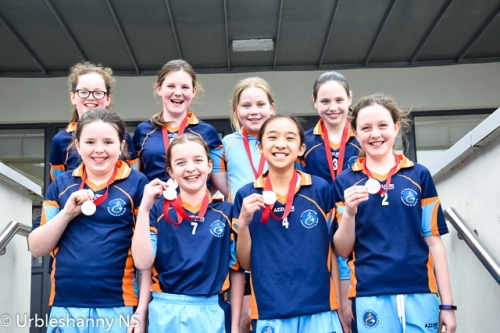 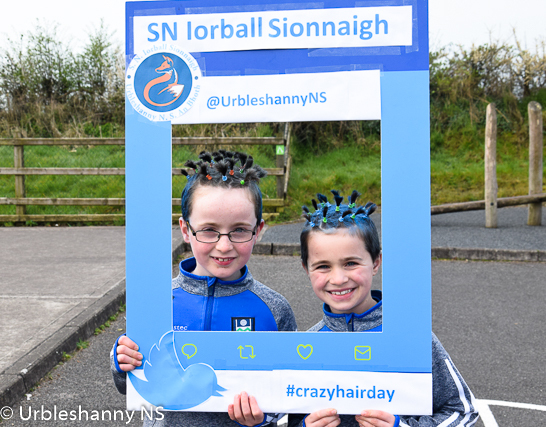 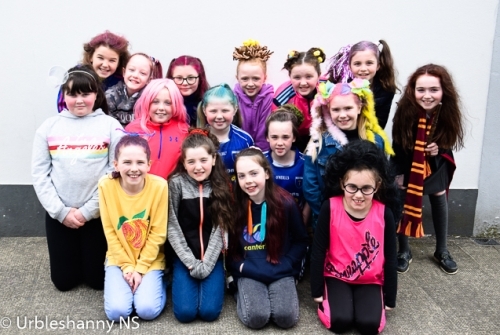 Eight of our senior girls missed out on Crazy Hair Day today as they participated in the FAI SPAR 5 a sides soccer tournament. The Girls team which consisted of Amy, Leah, Ruth, Shannon, Melissa, Alisha, LilleMai and Kate were runners-up in the County Finals today in Gortakeegan. 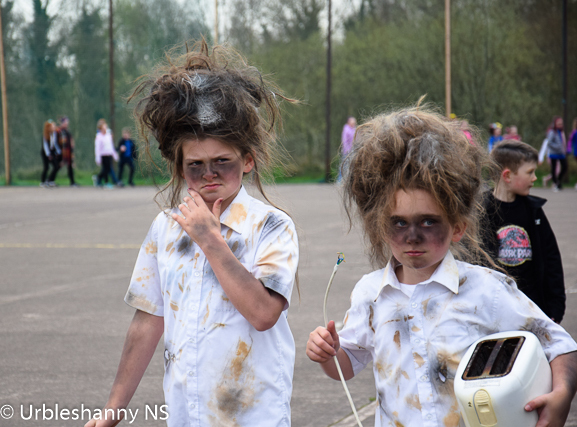 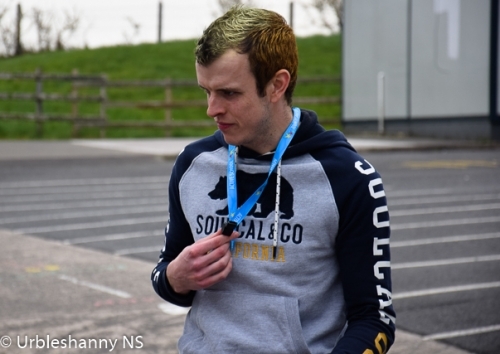 Well done to the team who won in second place and managed to get back in time to get some crazy hair for photo shoots! There were hundreds of photographs taken today but only a certain number could be added to the website. 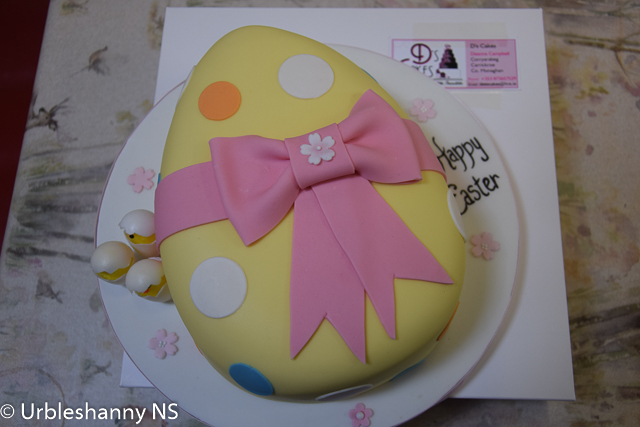 We hope you enjoy the uploaded images below.